Jerry and Holly are spending a busy summer in ministry activities in Westcliffe, Colorado. They regularly host spiritual retreats at the cabin. The magnificent views from each window bring to mind Psalm 145:5 “I will meditate on the glorious splendor of Your majesty and on your wondrous works “. The inspirational view is the backdrop for morning devotionals held for individuals or couples who visit for coaching, marriage counseling, renewal and refreshment. The famous Leachman hospitality makes folks feel comfortable, blessed and deeply connected to the Holy Spirit. Breakfast, lunch and dinner provide the chance to deepen relationships, spiritual understanding, and to observe a Godly marriage in action. Jerry and Holly’s openness and transparency are a demonstration of how the love of Jesus is the foundation of a marriage and can transform families. Jerry does not sit still. He continues to be in touch with his “men”, coaching, encouraging, admonishing by email, text and phone. In the community God has provided openings for witnessing through adventures, fun, hikes, ATV rides, and even parades. 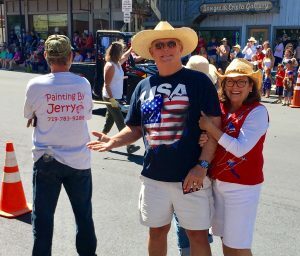 At all local events, Jerry and Holly are reaching out to community members. For those of you who know Holly, it is rare for her to walk through town and not get involved in a heart level conversation with friends or strangers. These almost always end with a hug, prayer or blessing. Watching Jerry walk around the annual rodeo, you know he is both watching and praying for the safety of each of the bronco riders as well as the horses, bulls and sheep! In addition to the homestead, Jerry and Holly are active in a community which meets in a chapel in the woods, and which draws worshippers from all over the world. 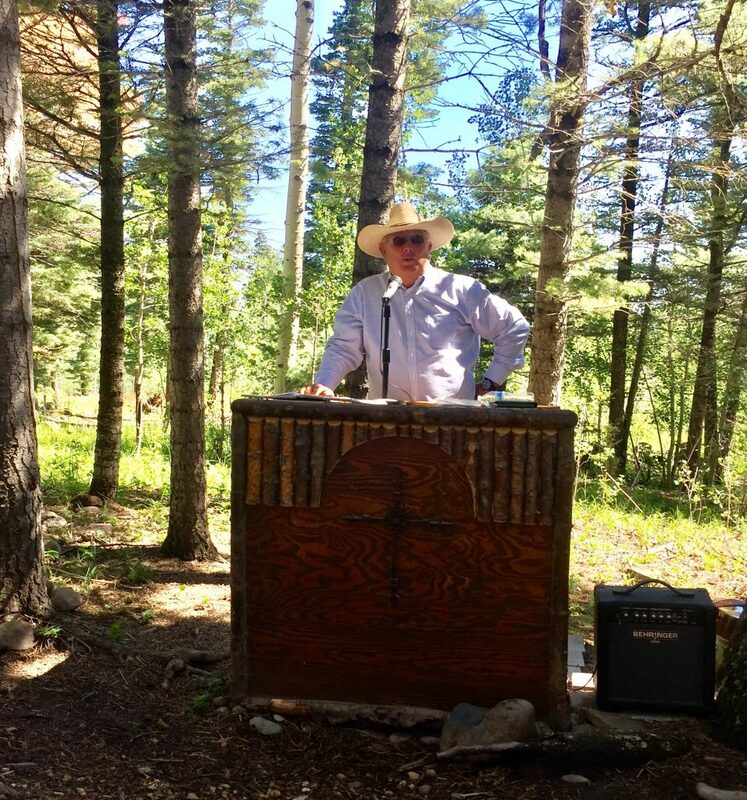 For 20 years they have supported this chapel and Jerry frequently brings the Sunday message. Last week Jerry’s message was about how Jesus Christ established a level four friendship with his beloved disciples, and how he wants to have that deep level of relationship with us as well. He challenged each person to invest in their relationship with the Lord and with special friends and family. All were moved to tears. A little girl was so touched that she gave Jerry her favorite rock, which he prizes. Whether in the D.C. area or Westcliffe, the Leachmans continue to serve, counsel, teach, encourage, and to walk with people in their good and hard times. They keep their eyes on Jesus Christ, and try to put Christ on the scoreboard in any way and every way they can. Please keep the Leachman Ministry in your thoughts and prayers throughout the summer. P.S. Please remember the Leachman’s in your giving as their ministry account tends to dip in the summer. Thanks!